This entry was posted in Love, Psychology and tagged animals, Ashleigh Brilliant, Cavalier King Charles Spaniel, Chocolate Lab, dog, happiness, Melody Gardot, relaxation. Thank you for the fun post and photos. I have a chocolate lab named Duke (jokingly named Duke of Cadbury on his registration papers.) He and I are best buds and he is my shadow. I wrote a song about him named “My Old Friend” and put it on my blog awhile ago. Oh, you’re very welcome! I’m delighted that you enjoy them. 🙂 Having a chocolate lab of your own, I know you can well appreciate the many happy times we have with Beau (and I LOVE Duke’s registered name–so clever!). Will look up your song! You picked a great quote! 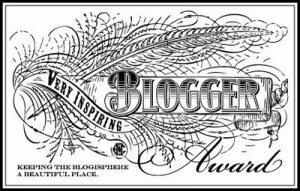 Hi, i’nominated you for the Prolific Blogger Award ! Thx, Cristi, though I don’t think I can accept this one at the moment–haven’t been posting much at all…. Gosh, Cristi, you are so kind! Thx for this recognition! How comforting are these pictures! I’ve been nominated you for the “Super Sweet Blogger Award”.You are free to accept or not.